With income inequality at record levels (Mishel et al. 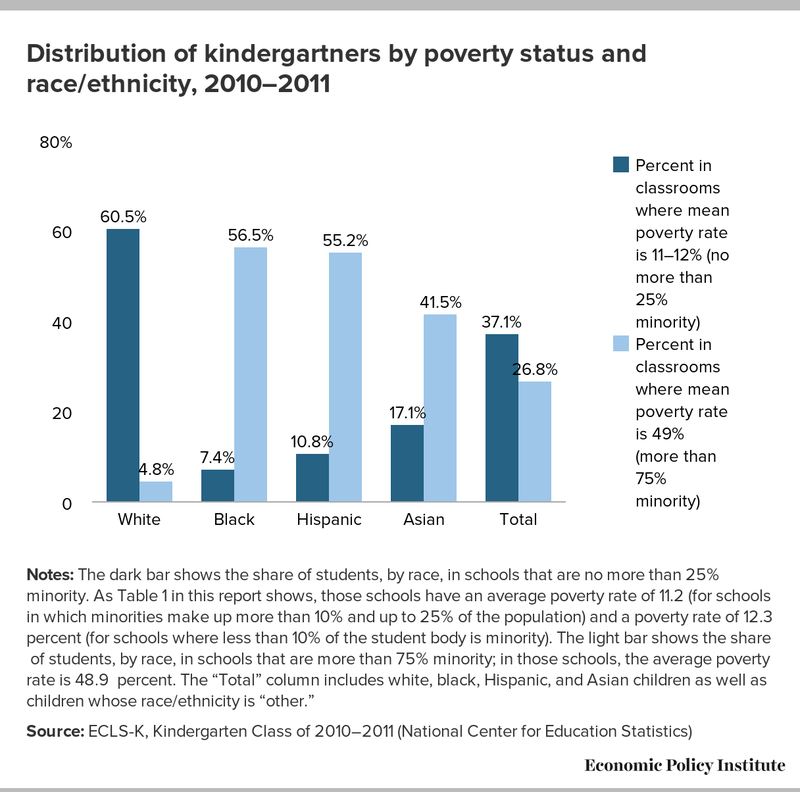 2012), the interactions between poverty and race remain strong and troubling and continue to impede educational progress for many students. One result of such interactions is ongoing segregation—at both the neighborhood and school levels. Yet most education “reforms” focus on a narrow set of policy fixes that minimize the roles of poverty and of race and overlook the impact of segregation. As scholars document the connections between neighborhood- and school-level segregation, it is important that we better understand how both affect schools and students in order to more productively guide both future research and policymaking. This paper uses data from a recent representative cohort of U.S. students entering kindergarten—the National Center for Education Statistics’ Early Childhood Longitudinal Study, Kindergarten Class of 2010-11 (ECLS-K:2011)—to begin to do that. We first describe how segregated schools are by both race and income, by comparing the racial and socioeconomic status (SES) composition of those kindergarten classes with what they would look like if they represented the characteristics of the U.S. student body overall. We then explore the differences in students’ other characteristics based on the racial makeup of their own classes. Finally, we analyze how their academic performance changes over that first year (as measured by their place on the score distribution in math, reading, and approaches to learning at entry in the fall and again in the spring) by level of segregation in the school. While the family characteristics of white children vary relatively little depending on the type of classroom they are in (unless that classroom is very heavily minority), family characteristics of black and Hispanic children vary substantially from heavily white to heavily minority schools. This is a stark statement about the connection between neighborhood segregation and segregation in our nation’s schools. In order to understand the precise implications for children in those schools, we must first understand both the extent and dimensions of that segregation. Sixty years after the U.S. Supreme Court declared “separate but equal” unconstitutional in its seminal Brown vs. Board of Education decision, separate and unequal remains the reality for many black, brown, and white children in the United States. In other words, not only has Brown failed to fulfill its promise of integration, as Rothstein writes, but it was followed by decades of policy decisions at all levels of government that have solidified systems of segregation and severe inequality. These systems expand opportunity gaps between minority and white children and challenge the ideal of a socially cohesive nation. Research makes fairly clear that racial integration—enabling white students to learn together with black and Hispanic students, and vice versa—benefits all student groups (Coleman et al. 1966, Orfield 1978, Kahlenberg 2006, Tefera et al. 2011). Unfortunately, race is not now, and has never been, decoupled from socioeconomic and other differences. When it is isolated, the statistical disadvantages of racial minority status are often revealed to be fully explained by other factors. In other words, it is not really about race; rather, it is about the myriad factors associated with growing up a minority in the United States. Indeed, recent work by Sean Reardon shows that, while prior decades of integration helped narrow achievement gaps between black and white students, recent increases in income inequality have led the achievement gap between lower and higher income students to grow; now the income-based gap far surpasses the race gap (Reardon 2011). However, real life rarely enables us to disentangle factors associated with racial minority status. So being black, or Hispanic, continues to wrongly appear to be the problem, which may discourage parents who have the option from choosing integrated schools. As such, it is critical that data analyses help us unpack the interactions among race, income, and other factors, and uncover channels, such as segregation, that link race and achievement. By clearly identifying these interactions, we can outline policies that correctly target the real problems that impede education progress for many of our children. 1) Black and brown children encounter distinct obstacles to entering integrated/white schools. 2) Minority students who do succeed in entering integrated/white schools look substantially different from their peers who do not. Many factors affect a student’s level of success in school, as measured by test scores, grades on report cards, attendance rate, and, later, high school graduation and acceptance to and entry to college. Research finds that out-of-school factors can have an impact as big as, or even bigger than, within-school factors such as teacher quality and other school resources (Berliner 2006 and 2009; Rothstein 2004; Barton and Coley 2007). Those out-of-school factors include the type of neighborhood in which students live and, as a result, their peers both in and out of school (Kahlenberg 2012; Sharkey 2013). In the education literature, peer effects have been found to have distinct impacts on student outcomes (Coleman et al. 1966; Hanushek et al. 2003; Summers and Wolfe 1977), and because peer effects can reflect the influences of neighborhoods as well as schools, they merit further exploration. Sixty years after Brown, we can look back on decades of education, housing, and other public policies to see the resulting patterns of segregation with significant implications for the well-being of our education system, among others. A combination of intentional and unintentional factors has created the circumstances in which today’s children grow up and go to school. As our nation continues to grapple with stubborn race-based achievement gaps, key questions arise regarding the impact of segregation on children’s educational experiences and students’ odds of success. Understanding these impacts is critical to formulating policies that have real potential to close gaps. Documenting the consequences of such segregation, and of the concentrated poverty that usually accompanies it, starting in children’s first years in school, can thus help shine a much-needed spotlight on this factor. This analysis also provides a foundation for understanding the consequences of segregation that are relevant to both researchers and policymakers. Indeed, after several decades of policies that ignore many of the factors that most affect student performance, we have begun to address issues related to student poverty. In contrast, we have paid little attention to related problems around segregation. Current policies continue not just to dismiss segregation’s impacts, however, but, in some cases, to perpetuate and compound them. Better understanding the extent and effects of segregation could help drive a more effective and comprehensive approach to education policy. A recently released study by the National Center for Education Statistics (NCES) provides nationally representative information about the current generation of kindergartners, the class of 2010–2011. The Early Childhood Longitudinal Study (ECLS-K: 2011), offers detailed information on family background, teacher and school characteristics, and educational outcomes. Among the school characteristics is a variable of the percentage of minority students in each child’s school. As is true of most databases, information regarding the child’s race/ethnicity and parental socioeconomic status (SES) is also available. School composition, percentage of minority students: This variable indicates whether the percentage of minority students is up to 10 percent, more than 10 percent up to 25 percent, more than 25 percent up to 50 percent, more than 50 percent up to 75 percent, or more than 75 percent. Race/ethnicity: This dummy variable indicates whether the race/ethnicity of the child is white, black, Hispanic, Asian, or other. The definition of poverty used in this dataset, and in this paper, is household income at or below 200 percent of the federal poverty line. Most economists and policymakers view this as the threshold below which families need substantial government assistance in order to provide the basics, and most Americans would consider families under this threshold to be poor. The analysis uses the results from the first wave of the study, corresponding to the entry of the students in kindergarten, for the demographic characteristics. Academic achievement variables are measured both in the fall and in the spring semesters. While fall characteristics may reflect peer effects that are due only to neighborhood characteristics, as no schooling has yet taken place, spring variables would presumably also reflect in-school peer effects. Not surprisingly, however, not all classes are populated by a mix that reflects the composition of the U.S. kindergarten student population. As Figure B shows, about a fifth (18.8 percent) of kindergartners start their education in schools with a very low proportion (up to a 10 percent share) of minority students while another fifth (18.3 percent) are in schools with more than 10 percent but still less than 25 percent minorities. 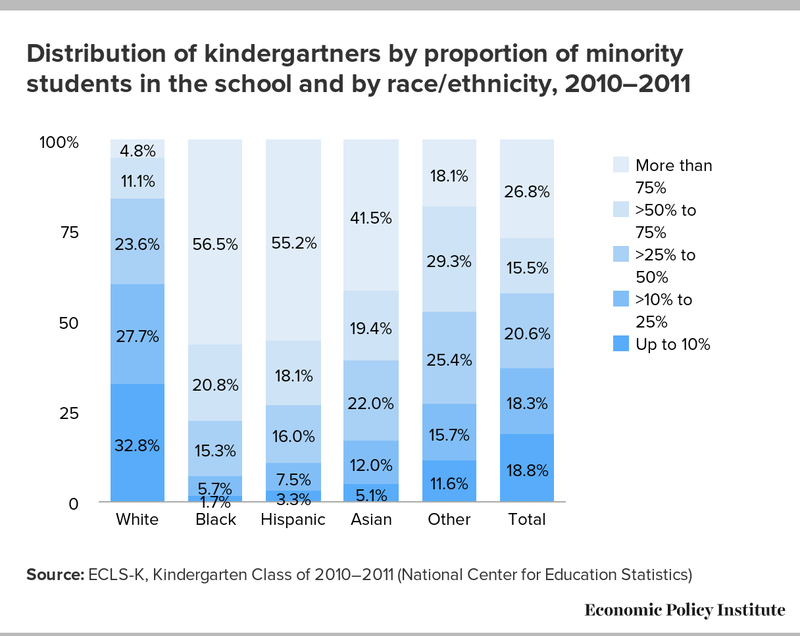 A similar proportion (20.6. percent) of kindergartners are in schools with a medium proportion (between 25 and 50 percent) of minority students. 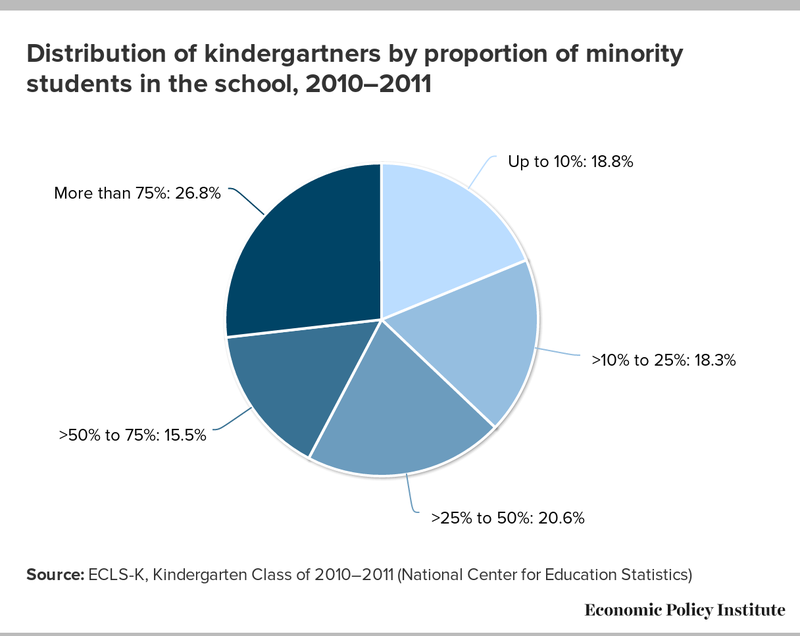 And in 2010–2011, over a quarter of kindergartners (26.8 percent) attended schools in which the proportion of minority students was greater than 75 percent. In other words, we know from basic data that students are not randomly distributed by race across kindergarten classrooms/schools. This disparity may, or may not, be of concern, depending on our findings with respect to the other characteristics of the children in these classrooms. If nonrandom sorting by race did not lead to segregation by income or to differential learning patterns, it would not merit much policy attention. The following descriptive analysis suggests, however, that policy attention is, indeed, merited, because 1) the racial composition of a child’s class does depend heavily on his or her own race; and 2) the nonracial characteristics of a student’s peers— particularly, those related to socioeconomic status—depend not only on that child’s race but also on the racial composition of the school he or she is attending. These patterns, both serving as mechanisms through which segregation could play a role in school settings, may have cumulative effects that compound one another. Racial segregation tends to mean income segregation, and, as Figure C shows, minority students are more likely not only to be in heavily minority schools, but to have poor peers. Three-fifths (60.5 percent) of white kindergartners are in classrooms in which only about 12 percent of their classmates are poor. Nearly as great a share of black students (56.5 percent) and Hispanic students (55.2 percent) are in classrooms in which nearly half of their peers are poor.6 Less than 5 percent of white children are in such heavily poor classrooms. By illustrating the distribution of children by race in schools with heavily white, mixed, and heavily minority student bodies, Figure D emphasizes the likelihood that whites are in low-minority schools, while black, Hispanic, and, to a lesser extent, Asian students, are in high-minority schools. 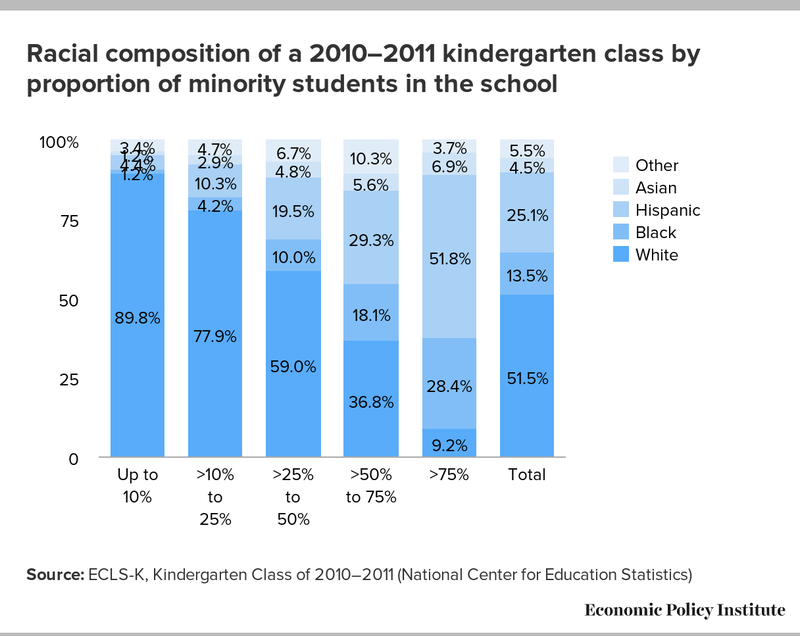 The figure shows that nearly a third (32.8) percent of white kindergartners are in schools with a very low (no more than 10 percent) share of minorities while another near third (27.7 percent) are in schools with a low proportion (over 10 percent but no more than 25 percent) of minority students. In contrast, more than half of black and Hispanic students are in schools with a very high proportion (more than 75 percent) of minority students. The most heavily white schools stand out: Only about two percent of black students and only about three percent of Hispanic students enter schools with such low proportions of minority students. By definition, schools with large proportions of minority students have a majority of minority students in their student body. But our data analysis, presented in Figure E, shows that the racial distribution (the percentages in each of the bars) is slightly more skewed than it would be if that distribution accorded with each of our breakdown categories (the labels below the bars). For example, we should expect to find about a 12.5 percent share of white children in schools with more than 75 percent of minority students (because those schools as a category would include schools that have as few as zero white students and as much as 25 percent white students, with 12.5 percent in the middle). But as shown in the second bar from the right, on average, only 9.2 percent of students in these heavily minority schools are white. A major factor that varies by student race and school racial composition is student poverty. White kindergartners attending heavily white schools (“Up to 10%” in Table 1) are about as likely as the average white kindergartner to live in poverty (11.4 percent versus 12.9 percent). In contrast, the few Hispanic kindergartners in such schools are only half as likely as the average Hispanic child in kindergarten to live in poverty (22.1 percent versus 46.2 percent), and black children in heavily white schools are even less poor—one third as likely to live in poverty as the average black child in kindergarten (14.3 percent versus 45.4 percent). In heavily minority schools, the inverse pattern is seen: All children’s odds of living in poverty, including those of white and Asian children, increase relative to average, though white kids’ odds increase the most. In extremely heavily minority schools (more than 75 percent minority), almost one in four white kindergartners live in poverty (22.9 percent, versus 12.9 percent for the average). Among black and Hispanic students in heavily minority schools, however, that rate is more than double: over half —51.4 percent of blacks and 56.5 percent of Hispanics—live in poverty, versus average poverty rates of 45.4 percent for black students and 46.2 percent for Hispanic students. Another factor that varies similarly by school composition and by the child’s race, is mother’s educational attainment. While, overall, mothers in schools with low proportions of minorities tend to be more educated than average mothers, the mothers of white and Asian kindergarten children are no more likely (even a little less likely) to have a bachelor’s degree in a heavily white school than they are on average: 15.6 and 32.8 percent, respectively, of white and Asian moms in heavily white schools have a bachelor’s degree or more education, versus 16.7 and 35.0 percent on average. However, mothers of Hispanic kindergartners in heavily white schools are twice as likely as average Hispanic moms to have at least a bachelor’s degree or more education (11.6 percent versus 5.6 percent), and only two-thirds as likely as average moms to have a high school degree or less (41.8 percent versus 66.4 percent). A similar pattern holds true for mothers of black kindergartners; 17.5 percent of those in heavily white schools have a bachelor’s degree or more education, versus 8.6 percent on average for black mothers. Two other potential sources of disadvantage for minority students are also reflected in the data. The first is nonknowledge of English and its utilization at home. The second is a measure associated with family structure and its stability, represented in our table by the likelihood of living in a family that does not have two parents. As we would expect, only a small proportion of white and black kindergarten students report not using English as a first language at home or not being bilingual (1.8 percent and 3.9 percent respectively). The proportions are much larger for Hispanic (47.6 percent) and Asian (54.4 percent) children. This, too, varies greatly by type of school, however. In the most heavily white schools, only 13.0 percent of Hispanic and 32.0 percent of Asian kindergarten students do not use English regularly. In other words, Hispanic students in such schools are less than one third as likely as the average Hispanic student not to be regularly exposed to English at home. In the most heavily minority schools, in contrast, more than 59 percent of both Hispanic and Asian students speak a language other than English at home. Statistics regarding the proportion of children who do not live with two parents likewise indicate disproportionate disadvantage for some groups of children in very heavily minority schools: 70.1 percent of black kindergartners in such schools do not live with two parents (versus 63.3 percent of black kindergartners on average), compared with 25.2 percent of white (versus an average of 22.5 percent).8 While these differences between students in heavily minority schools and the average are not very large, the contrast is stark in schools that are 10–25 percent white. A shift to a school with fewer minority students is associated with nearly halving single-parent households among black students; only 39.1 percent of black students in these schools do not live with two parents, while the proportion falls by only one fifth, to 19.1 percent, for white students. Here, too, we find associations between students’ family and school characteristics and the outcome of interest. The relative position of children in the performance distributions in reading, math, and approaches to learning is associated with both their own race and the proportion of minority students in the school they attend. However, changes in that performance over the academic year appear to be associated mainly with the level of segregation of the school.10 White, black, and Asian kindergarten students with better-than-average performance in the fall assessment are all clustered in schools with proportions of minority students between 10 and 50 percent. For example, white kindergartners in schools with minority shares between 10 and 25 percent scored about a tenth of a standard deviation higher on the fall reading assessment than the average white kindergartner (0.254 versus 0.164, in the first data column, comparing the second set of rows and “total” rows of our table). In contrast, the white students with the weakest school readiness skills attend the most heavily minority schools: White students in those schools had a standard deviation score of 0.077 on the fall reading assessment, compared with 0.164 for the average white kindergartner. Among Hispanic kindergartners, too, the highest-performing are in schools with a very low proportion of minority students, and all Hispanic students in schools with up to 50 percent minority students start off better than the average Hispanic student. Following this pattern, the most academically disadvantaged Hispanic students attend schools in which the proportion of minority students exceeds 50 percent. White children’s skills also improve relative to the average in mostly white schools, though not nearly as much (in standard deviations, from 0.100 to 0.158 in reading, from 0.242 to 0.257 in math, and from 0.039 to 0.044 in approaches to learning). And even the few white children in the most heavily minority schools make relative gains, though to a very small degree; in reading (from 0.077 to 0.089) and in math (from 0.089 to 0.096). But they experience a small drop in their relative position in approaches to learning, from 0.183 to 0.137. Unlike their black counterparts, Hispanic children make academic improvements in relative terms across all types of settings but, interestingly, experience a relative setback in their noncognitive skills when attending the whitest schools. 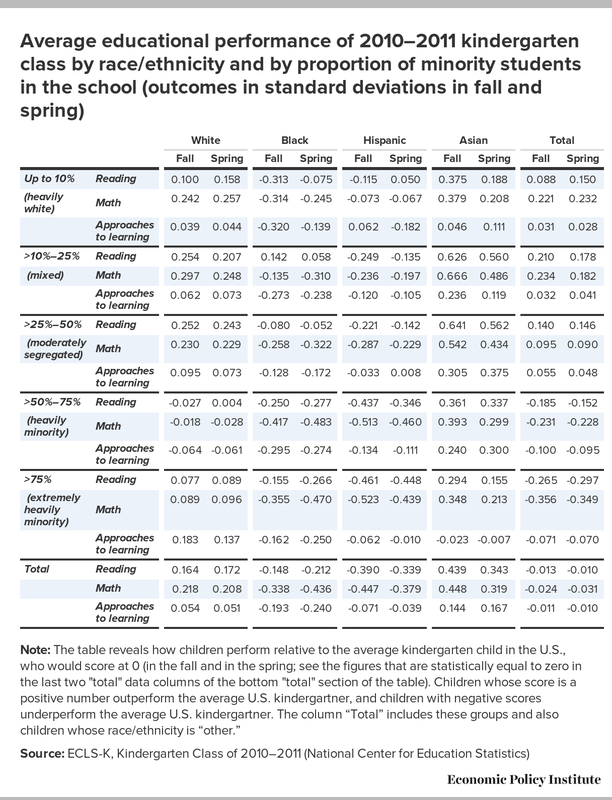 Looking at shifts across the fall and spring distributions among racial groups (last three rows of the table), Hispanic students move up in all three outcomes relative to the average student; white students’ reading performance improves, and Asian children’s approaches to learning performance increases, while black children lose relative ground on all three outcomes. As noted above, this analysis is a purely descriptive one. Our work is an attempt to further illuminate the connections between segregation and performance. This evidence suggests that the residential segregation that drives race and income stratification can likewise influence school peer effects in a nonrandom manner: As described earlier, the overall poverty rate in the whitest schools—about 12 percent—and in fairly white schools—about 11 percent— contrasts starkly with that in extremely heavily minority schools, where half of all students are poor. This finding points to the importance of addressing issues of race within education policy, even though race itself does not cause the problems. We do not uncover any causal links between segregation and performance, nor can we derive impacts of factors such as poverty or family structure on student performance. However, these findings do raise important questions and implications for both future research and for policymaking. Further research will not only further highlight the consequences of segregation, and the mechanisms through which it can affect (or mediate) educational outcomes. It will also lay the foundations for shaping comprehensive policies that, in contrast to narrow current policies that focus heavily on within-school factors, hold promise to alleviate problems thwarting improvement of the U.S. educational system. Again, with only a descriptive analysis, we must be cautious in issuing policy suggestions. What we can say, however, is that these interactions across family, school, and neighborhood factors shape conditions for learning in ways that are worthy of policy attention. And given the relatively narrow focus of most current education policy discussions (and policies themselves), our work here suggests, at the very least, the need for policymakers to look at a much broader set of inputs—and their interactions—into student, and school, success. In other words, given that minority students seem to face greater barriers than nonminority students in accessing the types of schools that are most likely to help them improve their relative performance, exploring both causes of those barriers and their impacts should be a high priority. Since some combination of parents’ and/or families’ backgrounds and resources, and peer effects and school resources, produce different patterns of learning for students, those factors must all be considered when ensuring that future education policies are both better aligned and more comprehensive. —The authors gratefully acknowledge comments from Richard Kahlenberg and Halley Potter. Elaine Weiss has served as the national coordinator for the Broader, Bolder Approach to Education (BBA) since 2011, working with three co-chairs, a high-level task force, and multiple coalition partners to promote a comprehensive, evidence-based set of policies to allow all children to thrive. Weiss came to BBA from the Pew Charitable Trusts, where she served as project manager for Pew’s Partnership for America’s Economic Success campaign. Weiss was previously a member of the Centers for Disease Control and Prevention’s task force on child abuse, and served as volunteer counsel for clients at the Washington Legal Clinic for the Homeless. She has a Ph.D. in public policy from The George Washington University and a J.D. from Harvard Law School. 1. Indeed, these researchers uncover the role of income integration as a factor mediating/explaining many of the benefits of racial integration. 2. Whether a household lives in poverty is obtained from a household level poverty variable. This variable indicates whether the household income is below the 200 percent of the U.S. Census Bureau poverty threshold. More details are provided in Tourangeau et al. (2013), see pages 7.53 and 7.54. 3. We interpret this variable to indicate whether a child is exposed to English at home (Tourangeau et al. 2013, page 7.20). In addition to groups of children who speak only English or only another language, a third group is bilingual; we assume these children to speak some English and classify them as such in our work. 4. A more detailed definition of these variables is provided in Tourangeau et al. (2013). All variables are standardized (mean=0 and standard deviation=1). 5. The child was asked about number sense, properties, and operations; measurement; geometry and spatial sense; data analysis, statistics, and probability; and patterns, algebra, and functions (Tourangeau et al. 2013, page 2.6). 6. Asian students fall in between; 41.5 percent are in a classroom in which about half of their peers are poor. 7. In other words, minority children in heavily minority schools tend to be the poorest and to have the least-educated mothers—added disadvantages—while the few in white schools have socioeconomic advantages that are very rare among their families. 8. The difference is not significant for Asian students. 9. Standardizing the variables at both points allows us to assess changes in the relative position of each group in the total distribution of scores, but does not inform us of absolute gains in performance. The estimates are weighted to account for nonresponse on the child-level teacher questionnaires in the spring and fall semesters. 10. As emphasized above, this analysis is only descriptive, so we do not control for the many factors known to influence student performance, and that likely vary with student and school race, including student and family SES and school and teacher resources and other characteristics. 11. There is a minor improvement in the placement of the approaches to learning index of black children in schools with a proportion of minority students between 50 and 75 percent, but at the same time, the spring relative performance in math and reading of these students is the lowest of black children (and among the lowest overall). 12. The discussion about Asian students is kept to a minimum in this analysis. Because of the small size of the group, the relative academic advantage of Asian compared with other minority students, and the lack of much information regarding the racial composition of schools attended by Asian students, an in-depth analysis would require an independent study. 13. The overall math improvement is driven by Hispanics and by minor improvements by white and “other” students. Hispanic children also improve relative to the average in reading performance, as do white children. The exception is for Hispanic children in most heavily minority schools, who experience a decline in their performance relative to the average in reading. 14. According to our estimates, the average increase in scores between fall and spring is about 15 points in reading, 13 in math, and 0.2 in the approaches to learning scale. Full information about the point scales and changes over the academic year is provided by Tourangeau et al. (2013). Berliner, David. 2006. “Our Impoverished View of Educational Reform.” The Teachers College Record 108, no. 6, 949–995. Hanushek, Eric A., John F. Kain, Jacob M. Markman, and Steven G. Rivkin. 2003. “Does Peer Ability Affect Student Achievement?” Journal of Applied Econometrics 18, no. 5, 527–544. Kahlenberg, Richard D. (ed.) 2012. The Future of School Integration: Socioeconomic Diversity as an Education Reform Strategy. Introduction. New York: The Century Foundation Press. Mishel, Lawrence, Josh Bivens, Elise Gould, and Heidi Shierholz. 2012. The State of Working America, 12th Edition. Cornell University Press, 2012. National Center for Education Statistics (U.S. Department of Education). 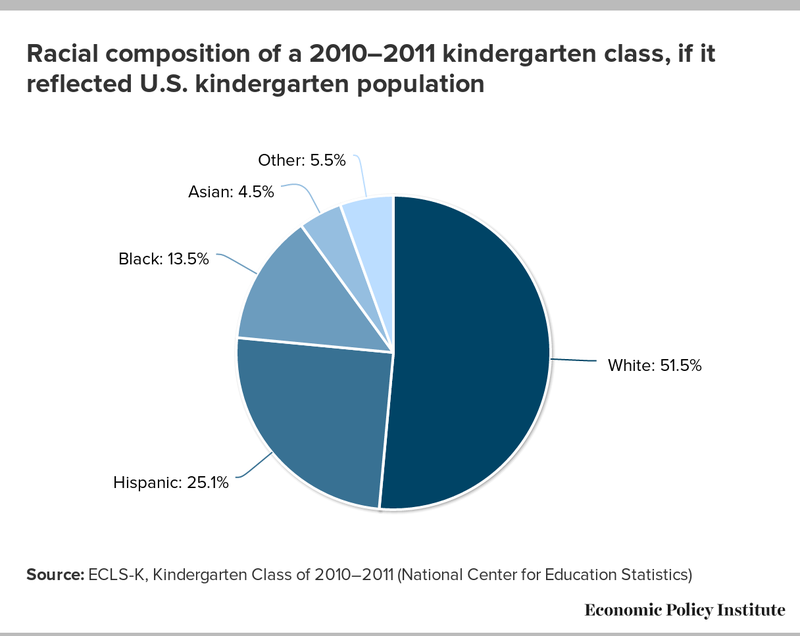 Early Childhood Longitudinal Study, Kindergarten Class of 2010-11 (ECLS-K:2011). Preliminary Restricted-Use Data File. Orfield, Gary. 1978. Must We Bus? Segregated Schools and National Policy. Washington, D.C.: The Brookings Institution. Orfield, Gary. 2013. “Housing Segregation Produces Unequal Schools: Causes and Solutions.” Chapter 6 in Closing the Opportunity Gap: What America Must Do to Give Every Child an Even Chance, Prudence L. Carter and Kevin G. Welner, editors. Oxford University Press. Reardon, Sean F. 2011. “The Widening Academic Achievement Gap between the Rich and the Poor: New Evidence and Possible Explanations.” In Whither Opportunity? Rising Inequality, Schools, and Children’s Life Chances. Greg J. Duncan and Richard J. Murnane, editors. New York: Russell Sage Foundation, 91–116. Rothstein, Richard. 2004. Class and Schools: Using Social, Economic, and Educational Reform to Close the Achievement Gap. Washington, D.C.: Economic Policy Institute. Rothstein, Richard. 2014. Brown V. Board at 60. Why Have We Been So Disappointed? What Have We Learned? Economic Policy Institute. http://www.epi.org/publication/brown-at-60-why-have-we-been-so-disappointed-what-have-we-learned/. Summers, A. A., and B. L. Wolfe. 1977. “Do Schools Make a Difference?” American Economic Review 67, no. 4, 639–652. Tefera, Adai, Erica Frankenberg, Genevieve Siegel-Hawley, and Gina Chirichigno. 2011. Integrating Suburban Schools: How to Benefit from Growing Diversity and Avoid Segregation. Civil Rights Project. Tourangeau, K., C. Nord, T. Le, A.G. Sorongon, M.C. Hagedorn, P. Daly, and M. Najarian. 2013. Childhood Longitudinal Study, Kindergarten Class of 2010–11 (ECLS-K:2011), User’s Manual for the ECLS-K:2011 Kindergarten Data File and Electronic Codebook (NCES 2013-061). U.S. Department of Education, National Center for Education Statistics.